How has such an encounter been possible? The French piano player Patrick Scheyder is known as an interpreter of Chopin and a promoter of a festival of classical music. 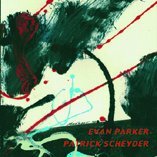 As Philippe Renaud writes in his liner notes: "Here, something magic happens...The more I listen to this record, the more I remember the improbable concert (the announced marriage between Coltrane and Chopin)..." And what about Evan Parker? Well, Evan is at the pinnacle of his musical development and we are very lucky to be able to hear his music.